Trying to raise my kids the best I can: AVATAR!!! OH. MY. GOSH. My new all time favorite movie. EVAH. James Cameron didn't just direct it. He wrote it too. The man is a genius. It was pretty romantic. Made me kind of fall in love with my husband again. I've heard people say it had a "sad ending". I completely disagree. The ending rocked!!! 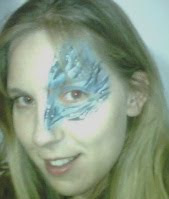 I got my face painted like an avatar at the theater and I love it. I would totally get it tattooed on my face, except that my husband won't let me. bipolar can lower your inhibition. So I'm thinking that Now wouldn't be a good time to commit to a face tattoo.